It was the 1970s, and I was a student in a Catholic high school, so of course I learned to pray. I learned how to meditate on flickering candle flames, a budding flower in a vase, and the ceiling tiles. I was guided in contemplation of songs by James Taylor, Simon and Garfunkel and Bread, and if it was a “really good” prayer experience, I cried. Although I shake my head over it now, I can see how all of that practice took me to a point in my senior year when, on our class retreat with Jesuits in Atlanta, I could immerse myself in a bit of lectio divina centered on John’s Passion account, be in the presence of the Presence, and give myself over to what I finally knew was real. I still remember that encounter, and in a way I still feel the > effects of it. So if contemplating (and crying to) “You’ve Got a Friend” helped get me there, it was good. But the bad part was that such experiences made me a bit of a prayer snob. 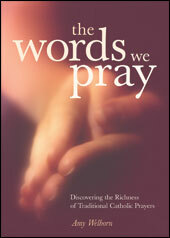 The message I absorbed and lived with for a good long time was that the only real prayer was mental prayer—that very personal and subjective experience that was mine alone—and that anything else, especially if it involved praying with words that someone else had written, was definitely not worth my time. Only children repeated memorized prayers and then closed their eyes to go to sleep. It was what the less enlightened did for penance—repeated they memorized prayers and assumed they were taken care of. Rote recitation of prayers written by dead people was not the practice of a spiritually mature person. Then, when I was about thirty years old, a friend made the most interesting suggestion: that we might pray the rosary together. The rosary. Well, at least I owned one, with beads made of light blue glass, most of them lightly scuffed with age and, yes, with even a bit of use (as a teen, I had fingered them often and murmured prayers to help me get to sleep). But since then, the rosary had not been my chosen means of prayer. In fact, I hadn’t practiced any prayer that I hadn’t dreamed up myself in years. I did go to Mass and pray the liturgical prayers, but I probably thought that, if given a chance, I could improve on them as well. So this is the attitude I brought to the table when my friend invited me to share in praying the rosary. But for some reason, despite my doubts, I agreed. If nothing else, the words could help me move to the really important thing, which was meditation. The words I was praying weren’t nearly as important as the state they put me in. They didn’t “come from my heart.” I wasn’t expressing my innermost thoughts in my own words., But one day, months down the line, months during which the rosary began to sink into my soul, I visited a monastery for a weekend of retreat. As night fell, I sat in the back of the monastery chapel, struggling to follow along as the monks prayed Compline, the final prayer of the day. These were difficult, transitional times for me or for my family, and we were all at the moment deep in a sea of disappointment and anger. And then, as Compline drew to a close and night settled, the monks started singing. It was what all monks sing at the end of Compline, everywhere. The Salve Regina. I had never heard it before in my life. The chant drifted through the chapel, settling around us like stars emerging from the night sky. Yes. I cry, banished, my own actions bringing tears to the lives of others. What could I do?